In April, Food Banks Alberta hosted a 3-week #GiveHealthy online food drive encouraging donations of healthy food. This innovative food drive allowed 20 food banks to each create their own specific list of most-needed items which people could choose from to then donate online. August 21, 2019 all the donated food is being delivered to Food Banks Alberta’s provincial warehouse in Leduc. 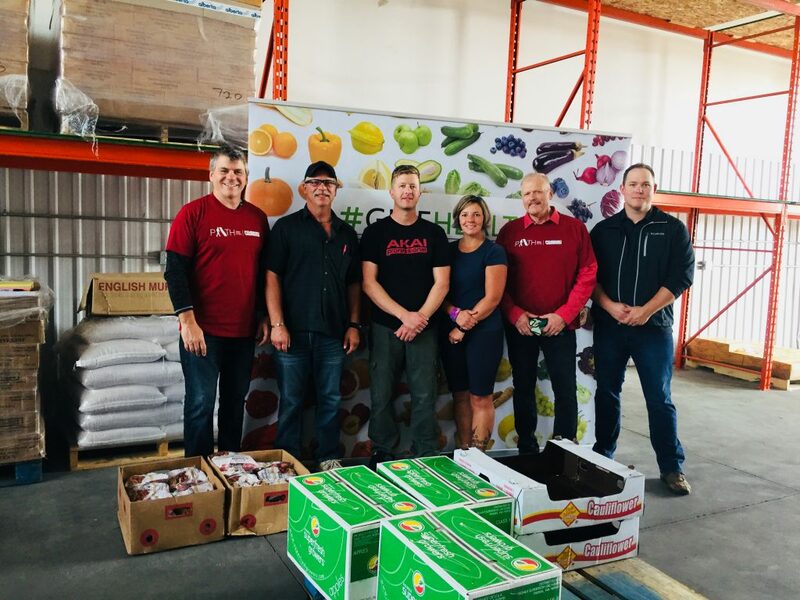 Pembina Pipeline Corporation partnered with Food Banks Alberta by sponsoring this online food drive and by engaging employees in their communities to donate. During the drive, Pembina matched employee donations to food banks at 150%. Food donated to the provincial food drive will be shared throughout the province and will be available to any of the 90 members of the association. “By supporting the #GiveHealthy food drive, we’re helping to address the issue of food security on a broader scale. As a company, we can contribute and we can mobilize our employees through volunteering and donation matching, but if through our support of this food drive we can also help spread the word and get our friends and neighbours involved, that is really when we’re going to have a tangible impact,” said Dave Ellery, manager of Pembina’s Central District. Food donated through the drive includes fresh fruit and vegetables, meat protein, pasta, peanut butter and other items identified by food banks as priority donations for their clients. A great last minute addition to the inaugural #GiveHealthy campaign was a new relationship between Food Banks Alberta and Soup Sisters, a non-profit social enterprise based in Calgary. For the campaign, the association purchased a ‘kettle’ of chicken noodle soup – that’s 3,600 servings of fresh soup for food banks to share with clients. A team of volunteers from Pembina Pipeline Corporation will be rolling up their sleeves Tuesday. They will be at the warehouse to unload the product, sort it and organize the donations for individual food banks. Some food banks from the area will pick up their donations Tuesday and others will be shipped out individually. “So many communities are experiencing food security challenges, and after seeing the impact of our Fresh Food Fund, which provides grants to food banks in partnership with Food Banks Alberta, we knew that we wanted to help address the issue in any way we could. The #GiveHealthy food drive was a great opportunity to enable people across the province to give back,” said Mr. Ellery of Pembina. This online drive encourages a shift in how people typically donate to their local food bank. The food donated is specific to the needs of each food bank, arrives fresh, and when it’s needed most. This saves valuable time and resources for food banks, as they don’t have to sort through expired or unusable items and dispose of them, often at their own cost. “Based on the very positive response to this first food drive, we plan to grow the #GiveHealthy campaign in 2019 and encourage even more individuals to change what and how they donate to their local food bank,” said Ms. Walsh-Rigby.